Guy C. Wiggins was born in Brooklyn, New York in 1883, the son of Carleton Wiggins, who had a long and highly acclaimed career as a landscape painter. The younger Wiggins, who first studied with his father, continued the American landscape tradition, winning many prestigious prizes from 1916 on. Around 1900, Guy C. Wiggins studied architecture and drawing at the Brooklyn Polytechnic Institute, but went on to study painting at the National Academy of Design. Early recognition came at age 20, when he was the youngest American to have a work accepted into the permanent collection of the Metropolitan Museum of Art. Old Lyme, Connecticut became Wiggins's summer home around 1920, and he became one of the younger members of the group of painters in Old Lyme who were developing their version of impressionism by fusing French technique with American conventions. Though American art was moving more and more toward realism, Wiggins was dedicated to maintaining his own style; it was based on French impressionism but influenced by Childe Hassam and other American impressionists of The Ten. 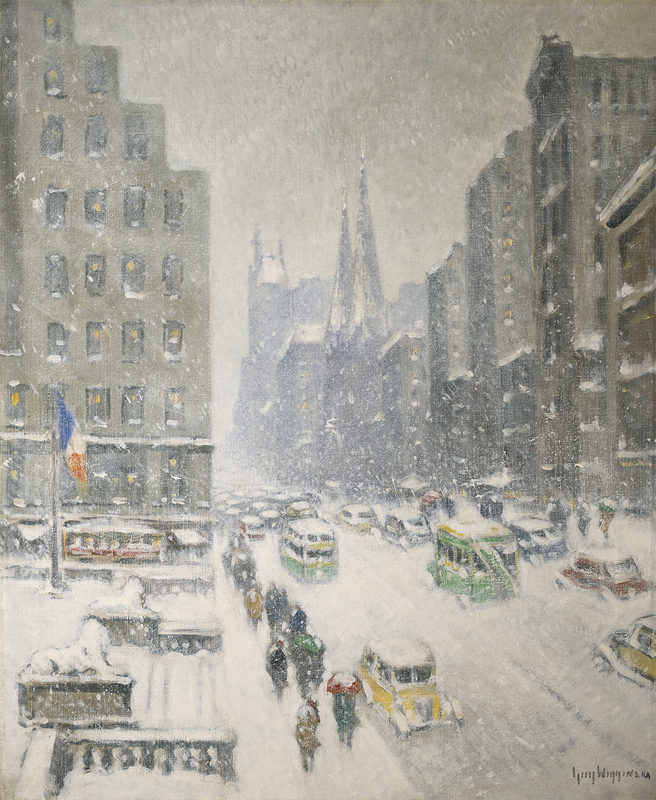 Wiggins earned a fine reputation in the 1920s for his city snow scenes, often painted from the windows of offices in Manhattan. 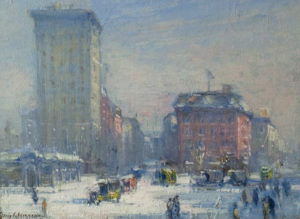 His Washington's Birthday (1930, New Britain Museum) expresses the feeling of snow quietly hushing the bustling city street. In her American Art Review article of December, 1977, Adrienne L. Walt said of Wiggins that "his resolution was to constantly emphasize color, elevating it above all else and achieving luminosity through it...."
In 1937 Wiggins moved to Essex, Connecticut and founded the Guy Wiggins Art School. During the following years, in addition to teaching, he traveled widely throughout the United States and painted scenes of Montana, Massachusetts and Connecticut. With the permission of President Dwight D. Eisenhower, he completed two paintings of the Executive Mansion from the lawn of the White House, one of which eventually was placed in the Eisenhower Museum in Abilene, Kansas, after hanging in the president's office. Wiggins died in Florida in 1962.